Should Companies Use Same Food Labelling to Help Manage Diabetes? Conduct a Poll This World Diabetes Day. Home » Blog » Online Polls » Should Companies Use Same Food Labelling to Help Manage Diabetes? 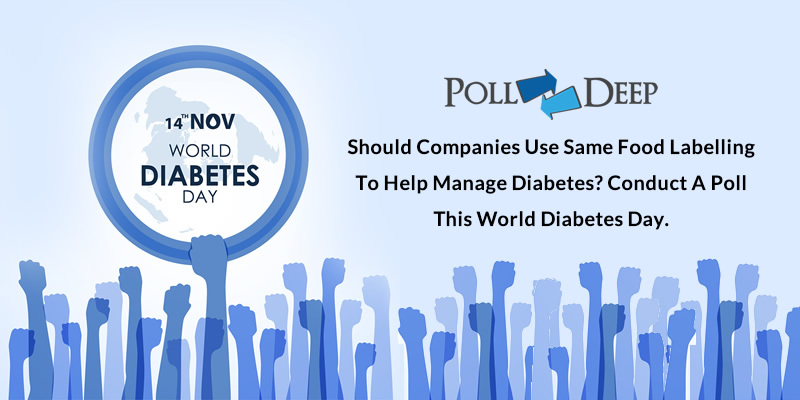 Conduct a Poll This World Diabetes Day. Diabetes is a metabolic disorder in which there are high blood sugar levels over a prolonged period of time. Diabetes is a lifelong disease; it has no cure, which means a person suffering from diabetes must manage the disease for a very long time to stay healthy. People living with diabetes know they have to be careful and watch the kind of food they eat to reduce their risk of serious complications. Maintain blood cholesterol by reducing your total amount of fat to thirty percent. Monitor your blood glucose, keeping them close to normal. To keep your blood sugar in control, there are some foods you need to start eating or eat more of and there is some food you need to steer clear of. This is the reason why food labelling could be a good way for people living with diabetes to know the right food to buy when they go groceries shopping. However, conducting polls and surveys (online and offline) is an effective way of knowing what people feel about same food labelling; this includes people living with diabetes and those who are not living with it. In a survey by the British diabetes association, when asked about what would help them manage their diabetes, 73 percent of 7,406 people said that if all cafes, restaurants and takeaways used same food labelling on the front of their food products, it would help them make healthier choices. In another survey of 2,121 UK adults, only 29 percent feel traffic-light food labelling is not important, the bigger proportion (71 percent) feel it helps them make healthier decisions. This makes the answer to the topic of this article more YES than NO. All forms of polls and survey are effective but online polls can be more effective for getting answers to the topic of this article. As of June 2018, 55.1 percent of the world’s population has internet access; this means online polls and surveys could be used to get the opinion of many, many people living in different countries of the world on what they think about same food labelling. The internet is in the palm of almost everybody in the world, so people can decide to participate without any form of coercion. Also, for researchers, online polls and surveys increases productivity by saving time because data is instantly available. The time taken for online polls and surveys is two-thirds shorter than the time taken for offline polls and surveys. Information is gathered automatically and response time is almost instant.